Side: The vascular tissue and the pericycle form a tube of conducting cells called stele. Xvlems are present in the centre of the root. Xylems are composed of tracheids and vessels. 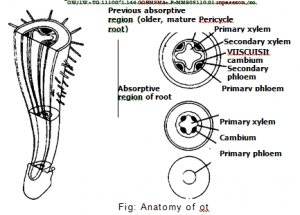 The xylem of the root is continuous %s al) the xylem tissue in the stein. The xylem tissues are surrounded bs the phloem tissues.lem and phloem elements (vascular tissue) are surrounded by pericycle.